As a matter of procedure, all human subject research must undergo scientific review and receive approval prior to being sent to the IRB. 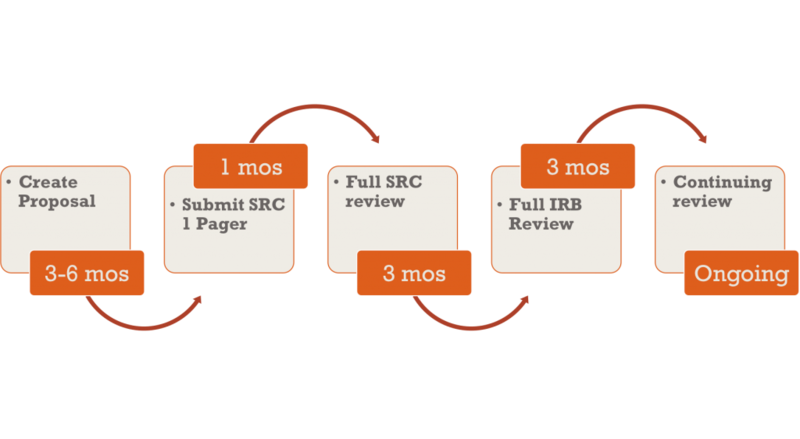 For students, the first step is to submit a one-page proposal (on the IRB & Scientific Review Documents page) by the designated Scientific Review submission deadline (first Monday of the month). Once your one-page proposal has been approved, please submit all completed IRB documents for scientific review. The study protocol and all necessary forms and addenda should be considered final and complete upon their submission to for Scientific Review. Use of the Document Checklist for Scientific Review is required in order to assist investigators with their document submission preparations. Also, please submit all editable material in Word document format, unless the document is a prefabricated PDF form. If you do not have Microsoft Word, as a student you may download it for free on the Microsoft Office website. If only minor changes are recommended, the scientific reviewer may require no further review before submission to IRB. In this case, investigators may make suggested edits, to their own satisfaction, and submit to the IRB at the next IRB deadline (first Tuesday of the month). If more significant changes are recommended, the scientific reviewer may request a complete re-submission, with edits. Depending upon the changes that are recommended, the reviewer will give instructions either to resubmit the proposal as soon as edits have been made, or to resubmit at the usual Scientific Review deadline (first Monday of the month by 5 p.m. PST), in a subsequent month. Investigators should submit revised documents to the reviewer, addressing all comments from the previous review. Approval from Scientific Review is still required before documents may be submitted to the IRB for review, and depending upon the quality of the re-submission, this could take longer than anticipated. The reviewer may request more than one round of edits. Please consider that most student submissions involving human subject research require major revisions before receiving SR approval. Student researchers should therefore budget for a period of 2-3 months between the initial SR submission and submission to the IRB. During review, the scientific reviewer will work with you to make any appropriate revisions and edits. Instructions and deadlines for re-submissions will be provided by the reviewer, after initial review. Please contact your reviewer with any questions about the review timeline or Scientific Review requirements. Once the submission passes Scientific Review, it is the responsibility of the investigator(s) or student(s) to send the complete submission, in electronic form, to Emily Stack, by the due dates listed below (the first Monday of the month by 5 p.m. PST, excluding holidays). Please Note: ALL research, including company-funded and investigator-initiated projects must be reviewed by SR prior to IRB submission. SR-approved documents are due to the IRB on the first Tuesday of each month by 5 p.m. Complete IRB submissions must be sent with the IRB Submission Checklist, in electronic form, to Emily Stack (by 5 p.m.). All submitted documents must be in Word formatting for editing purposes or in their prefabricated PDF format. If you do not have Microsoft Word, as a student you may download it for free on the Microsoft Office website. IRB Meetings are generally convened on the third Tuesday of the month. It is not required of mentors and students to attend the IRB meeting of their study’s review. However, if you would like to attend, please email the IRB chair, Dr. Richard Barrett to inquire if there is room for you to attend. Protocol Revision and Amendment forms are used when modifications to approved studies are required by the research team. All PRAFs must be sent electronically to the IRB Liaison, Emily Stack. The IRB does not accept PRAFs directly from investigators. Typically, a PRAF does not need to go through the full IRB review process. Assuming that the PRAF is accurate and complete, the IRB Liaison will gather all PRAFs and forward them on to the IRB every two weeks for immediate consideration. However, if the modification is complex or may substantially affect human subjects, the IRB Chair may not be able to expedite the PRAF and it will need to go to the next scheduled IRB meeting. Please Note: In order for a PRAF to undergo a full IRB review in a given month, it must be submitted by the IRB Liaison to the IRB by the first Tuesday of that month. If you have a concern that your modification may require full review, please be in contact with the IRB Liaison, Emily Stack, to assure that your PRAF gets to the IRB in time for the next scheduled IRB meeting or you may need to wait for the following month’s full review. All investigators are required to submit a Continuing Review Form annually to the IRB. This document should be submitted to the IRB Liaison, Emily Stack, one month prior to the study’s renewal date. Investigators are responsible for submitting this form on time; the NUNM IRB does not provide annual reminders. If documentation is submitted on or after the renewal date then all study related activities will be suspended until Continuing Review is approved by the IRB. Once all study related activities are complete (including data analysis and publication), investigators are required to close the study by submitting a Final Review Form to the IRB via the IRB Liaison.